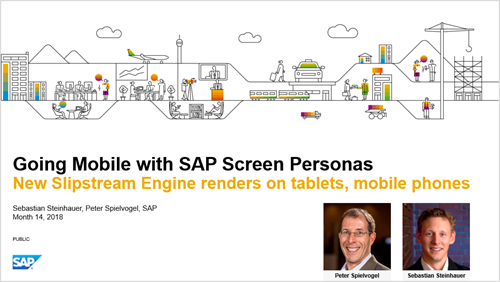 On March 14, 2018, ASUG presented a webcast on “Going Mobile with SAP Screen Personas: New Slipstream Engine Renders on iPad, Android, Mobile Phones”. Sebastian Steinhauer and Peter Spielvogel from the SAP Screen Personas product team discussed the new Slipstream Engine, introduced with SAP Screen Personas 3.0 SP6, and how it transforms classic SAP transaction screens into modern UI5 applications that run on desktops, tablets, and phones. The audience had many questions, and unfortunately, we ran out of time to answer them all. So, in this blog, I will address all the questions from the call, reorganized into some more logical categories. Can I run Slipstream Engine on a desktop and not just on my phone? Yes, Slipstream Engine is a web application that will run in your browser on a desktop, tablet, or phone. What happens if I run Slipstream Engine with an unmodified transaction on my tablet? You will see the full transaction, similar to what you would see on a desktop, on a device not designed to render a large and complex screen. So, while you will have access to all the controls on the screen, you will have lots of scrolling, tabbing, and typing to use it. We recommend using SAP Screen Personas to simplify screens before rending on smaller screen sizes. If I already have some flavors built, do I need to rebuild them for Slipstream Engine? I have some desktop flavors that my employees currently use. Do I need to start again to use on a tablet? No. Existing flavors will render on Slipstream Engine. If you are running on a smaller screen size, we recommend reusing your existing logic in the flavor and creating an adaptive design. Hmmm, I had to alter my Flavors to work. Nothing significant, but they had to be updated. Yes, this happens sometimes. It’s a similar situation to creating the flavor in the SAP GUI for HTML and rendering in the SAP GUI for Windows. You may need some fine tuning to make the screens look perfect. How does security/access work from a mobile device? SAP Screen Personas does not include a secure access solutions, but proven tools provided by SAP (for example. SAP Cloud Connector, or Web Dispatcher) or third party equivalents can be used. Can we Scan barcodes using the Mobile camera? Yes. Our knowledge base has instructions on building flavors with barcode functionality. Can I put a flavor into the Fiori Launchpad? Can the user tell if I made it with SAP Screen Personas? Yes. We have a Productivity Power Play about mobile flavors and the SAP Fiori Launchpad. Can SAP Screen Personas integrate with SAP Netweaver Portal and ECC? This would help with change management, especially when we are trying to migrate one transaction to Personas and all others remain in ECC or Portal. Yes. Our knowledge based describes how to launch flavors directly from NWBC. Since the flavor runs on a phone, does this make it a Fiori app? SAP has defined Fiori apps as having the following five characteristics: role-based, simple, coherent, adaptive, and delightful. Since SAP Screen Personas flavors running in the Slipstream Engine meet these criteria, the answer is yes. Please read the blog “SAP Screen Personas roadmap update for March 2018” to learn what we have planned for SP07 and beyond. You can watch the complete replay of the webcast here (registration required). It includes all the demos of how to simplify screens and make adaptive designs to run on various device sizes and orientations. Here are the slides (which do not include the live demos). For the SAP UX SIG team, Peter Spielvogel. Great webcast on the latest from Personas SP06 and the Slipstream Engine, many thanks to Peter & Sebastian for running this webcast for ASUG!